Whether you're celebrating or simply want to enjoy something extra special with family or friends, Laguna's Special Dinner set menu is the perfect choice. Enjoy a starter, a main, naan, rice, mixed vegetables, ice cream and an after-dinner coffee for just £19.90. Available all day every day. Book online for free text confirmation or call 0115 754 0589. Enjoy a tandoori starter and main for just £15.90. Available all day every day at Laguna. Book online for free text confirmation or call 0115 754 0589. Perfect for those who are watching their waistline. Enjoy a mixed grill of Tandoori Chicken on the bone, Seekh kebab, Boti kebab, Chicken Tikka and a Naan for only £11.60. Available all day, every day.Please note this offer may not be valid in December. Book online for free text confirmation or call 0115 754 0589. Very pleasant experience at one of Nottinghams oldest, more established Indian restaurants. The food was really good the starters came out piping hot, fast service attention to details. Lovely nans, curries we got 2 chicken and 2 panner ones, they checked to see if we was happy with all. The longest standing Indian restaurant in Nottingham (if I'm not mistaken) and it's easy to see why. Numerous customers have been coming for years and years to sample authentic, homely and richly flavoured Indian cooking, with a welcoming and family friendly service run by Tony and his excellent team. The service was attentive and entertaining , the food tasty, full of flavour and fresh, and all in a great environment. Long may Laguna continue! Very nice meal with excellent service. We were made very welcome from the moment we arrived. The special menu was made clear to us and the options were very good at a good affordable price. The meal was to a high standard. Certainly would go back again. Thanks! The food tasted fantastic at Laguna, especially the tandoori chicken. The service was good with lots of happy faces. The only little thing that I could criticize was that the naan bread was on the small size. Would definitely go again! Lovely meal, wonderfull service as always. Very busy as with all restaurants on a Saturday night, but the food was good and the service was good. About £25 a head for starters and a main with a drink at Laguna. Lovely meal as always! Great service! Super staff! Always good meal! Lovely staff. Food great as always. Very busy but well looked after as always. Staff very friendly with lot's of New Year greetings. Lovely meal. Great value for money. Very welcoming restaurant and delicious food. Had a very enjoyable evening. Always wonderful service and food at Laguna Restaurant. Staff go out of their way to welcome you. Food always very good. Great night out. Lovely meal! Really enjoyed ourself's. Woderful staff. Obviously a child-friendly place with personable service. Food was solid if not spectacular, but the Bangladesh beer was an interesting addition to the meal. Just can't fault this place! On arrival we were greeted warmly and seated promptly. The restaurant was full, but service was friendly and attentive. The menu offers a reasonable choice for vegetarians and my mushroom pilau was particularly good. I did not view the wine list, but my colleague was happy with the availability of Gewürztraminer, which he assured me goes best with curry, was a reasonable price, and tasted good to me. Very nice meal would go again. This was our first successful visit to Laguna - have never managed to get 'in' on a walk up before, it's that popular! The welcome was charming and we were shown straight to our table. Drinks (bottled Indian lager - good choice of Cobra, Lal, and Kingfisher if I recall,Carling on tap if you prefer, and J20 for junior) and poppadums with chutneys came quickly. Menu was fairly wide ranging with pretty typical dishes that you would expect. My OH had his 'calibration' dish of Lamb rogan josh - the dish he tries at each Indian restaurant to assess it, and I had a chilli chicken dish. Junior had keema peas. All of the food was cooked well - lamb was tender, chicken was moist yet cooked properly and keema peas were lamby and flavoursome. I would say that (judging by our dishes) Laguna goes lightly handed on the chilli heat. That's not to say that the food lacks flavour, far from it, but chilli heat wise they tread lightly, so don't be afraid of medium heat dishes. Laguanas could improve the exterior to make it a little more inviting but once inside, you are greeted with a warm welcome and nothing is too much trouble. The food was typical Indian cuisine, tasty but in this case not particularly adventurous. I think there are subtle changes the restaurant could make to enhance the experience wihtout it costing too much especially as they have Memsaab and Delhi just around the corner as a couple of competitive heavy weights. However, the nature of Laguanas is of a smaller, more intimate dining experience so they could market it that way. I wouldn't mind returning but it wouldn't be my first choice. Good food and service, would visit again. Good food, value for money. Service first class but a little too fast. Nice not to have purchase of drinks pushed at you. Excellent curry! Quailty service! All in all a great place to eat out, especially in a large group like we were. 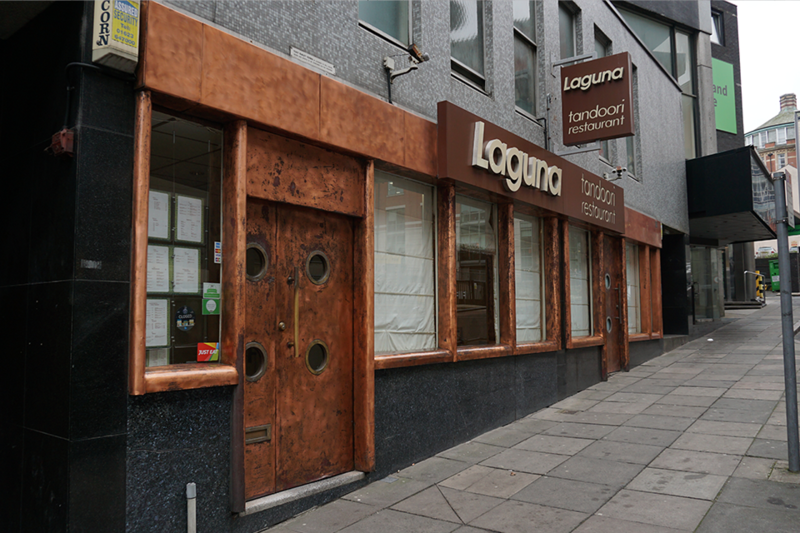 Situated on Mount Street, just off Maid Marian Way in Nottingham city centre, is The Laguna Tandoori restaurant. Recognised as the oldest Indian restaurant in Nottingham, the traditional cooking techniques and authentic recipes make it a delightful venue for connoisseurs and first-time triers of Indian cuisine. Despite its traditional Indian origins, the restaurant itself is contemporary in its design and decor. Flashes of terracotta on the walls, warm wooden furnishings, comfortable booth seating and upholstered chairs makes the dining room a cosy and relaxing place to enjoy a delicious curry or tandoori dish. The Laguna are able to cater for all sizes of parties, making it ideal if you are looking for a night out with friends or an intimate meal for two. The dining room has been divided up carefully in order to ensure that every table can enjoy intimacy and peace and quiet. Laguna pride themselves on delivering authentic Indian classics and use the traditional tandoor clay oven fuelled by charcoal to cook a wide range of meats and breads. Tony prefers to use the clay oven opposed to more modern gas and electric fired versions as the flavours intensify when cooked slowly over the charcoal. No curry paste is used at The Laguna, instead, combinations of spices are ground to order to ensure that every dish is flavourful and as authentic as possible. You can expect to find everything from the popular curries such as Rogan Josh, Korma and Bhuna, to more speciality dishes for the adventurous diner such as Shahjehani chicken prepared with fruits and herbs, and the Laguna Special with tandoor chicken cooked in oriental spices with chopped tomatoes. If it’s an authentic Indian meal that you are looking for, then Laguna Tandoori in Nottingham is the place for you. The value placed on traditional cooking methods and customer service is a refreshing change; you will leave having experienced real Indian hospitality and cuisine.